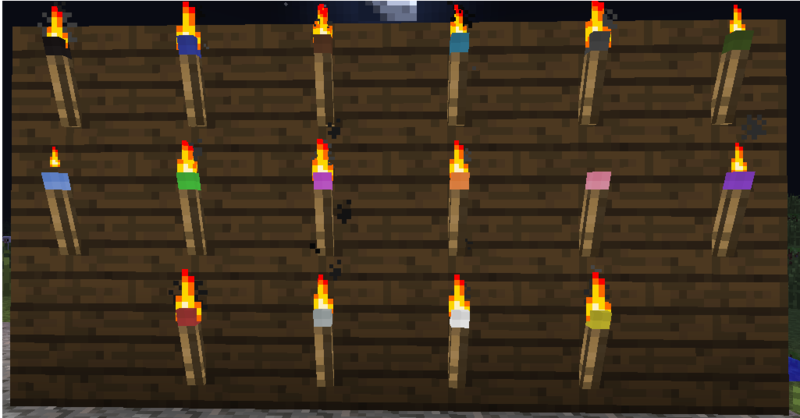 This mod is a simple, cosmetic mod that adds 16 coloured torches into the game. These torches could be used as a substitute to mini-maps, instead using different colours to mark locations/routes to those locations. Furthermore, the torches can be right clicked with the dye in hand to change it's colour, giving you the old colour back! Feel free to use this in private/public mod packs! please add redstone colored pls!!!!!!!!!!!! Works perfect on single player, but I would like to add it to my modpack and my modpack also has a server version. seems like a memory leak. Ever thought of changing the colour of the Flames that'd be nifty quite lot more tricky to implement though i'm sure if even possible, just a suggestion.